We’d love your help. 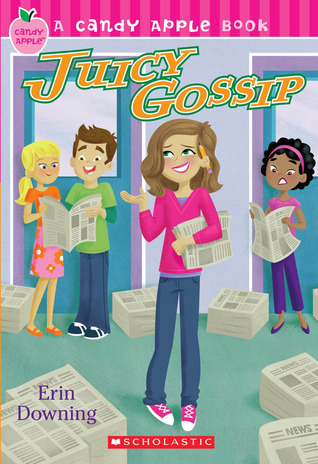 Let us know what’s wrong with this preview of Juicy Gossip by Erin Downing. Candy Apple books . . . just for you. Sweet. Fresh. Fun. Take a bite! Jenna Sampson, perfectly normal seventh grader and editor of the school newspaper, is mortified. Her parents are opening a super-embarrassing juice bar at the mall. Jenna has to work there . . . and wear a ridiculous uniform. She's pretty sure her life can't get worse, until she finds out that the school Candy Apple books . . . just for you. Sweet. Fresh. Fun. Take a bite! Jenna Sampson, perfectly normal seventh grader and editor of the school newspaper, is mortified. Her parents are opening a super-embarrassing juice bar at the mall. Jenna has to work there . . . and wear a ridiculous uniform. She's pretty sure her life can't get worse, until she finds out that the school paper might shut down. To ask other readers questions about Juicy Gossip, please sign up. Another fake book. Nothing seemed real! It's all about this girl whose parents get a juice bar restaurant at the food court in the mall. The girl hates shopping, so it's a burden, not a blessing. Then the school newspaper is in danger of being cut (Oh no! The horror! )so the girl starts a gossip section in the paper to get people to buy it, using gossip she hears from girls in the mall - gee, I don't know how that could go wrong, do you? Personally I love this book in many different ways. I wasn't able to put the book down and when I did I was eager to get back in to it because it was probably that I was sleeping or in the car! I personally think that if you are looking to read a book in less than 24 hours and just need something to just do I recommend this book. I do not like how they didn't say who the princess and prince was at the end, but it was kinda obvious and that was just one thing out of 176 pages! Juicy Gossip is about a girl. She is head of the newspaper committee. Her parents opened a juice bar and now she is mortified, because its in the middle of the mall where everybody from school will be YIKES!!!! On top of that The newspaper might be shut down!!! In order to stop that she puts the school gossip in the newspapers so more school kids will read them, and the newspaper committee will not have to be shut down. Although seventh grader Jenna Sampson is editor of the school paper, she couldn't feel further away from being in the know of popular topics, interests, and gossip in her school. Her parents are opening a juice bar in the middle of the mall, and not only does Jenna hate the mall, but she doesn't even like juice. So, now that her parents are forcing her to work there three days a week (and wear a pineapple hat -- no kidding), Jenna is terrified that her nonexistent popularity could go further into the negative. That is, if anyone notices she's there. As if that wasn't bad enough, Jenna has just found out that her beloved paper might be cut from the curriculum, along with a bunch of other activities. She writes a front page article about it, begging other students to rise up and fight the budget cuts, but she's horrified to find that no one even reads the paper that she puts so much work into. Jenna is going to have to find some way to get the other students to take notice. Lucky for her, she seems to overhear a lot of gossip at the counter of the food court. Could a gossip column work to save the school paper? I read this as part of my job to see what age group it would be appropriate for and I must say that it was very cute, appropriate for (I'd say) grades 4-7, and that I would actually read more of this series! Kudos to the Candy Apple writers! It was pretty good; only I didn't really always get the problem. It was soooooo boring!! 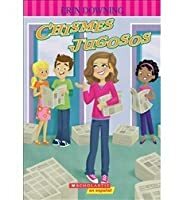 At the time I didint realize it because this was the only book I had to read and I was desperate but this book went no where and was just boring!! Snoozer!! It was a very good book, full of details. I WOULD BE FREAKED ABOUT THE WHOLE THING IF I WAS HER, SHE'S GOT NERVES LIKE CALLIE! Really good! Easy to relate to.........BOYS!!!!! Too bad you can't find out if Jenna and Peter get crowned King and Queen because I think they should! Andie "the character "little miss mango" made some bad choices. the bad choices made the book interesting. My favorite candy apple book!!!! Personally, I hated this book. There is not much character development, literary elements, etc. i know it's a kid book but there are hundreds of books out there for kids that are sweet and well-written with great heroes/heroines. Read this in 6th grade and loved it. I got my cousin to read it too. I can't WAIT TO READ THIS BOOK i WAS LONGING TO READ i JUST Thank God I FOUND GOODREADS.